Created by five former IBM employees in 1972, SAP has grown to become the world’s third largest independent software manufacturer with more than 66,500 employees and more than 253,000 customers worldwide. If you’re a user of SAP, you know how vast this software is; too big, in fact, to ever learn it all. 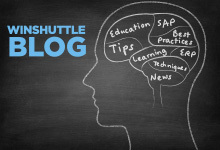 When I joined Winshuttle 6 years ago, I had no idea what SAP ERP meant. And when I was given an overview of how Winshuttle integrated with SAP, I felt like I was in a Peanuts cartoon…”Wah, Wah, Wah…” What? We developed this SAP Quiz as a fun way to give Winshuttle employees a tiny glimpse into a world of transaction codes (the many thousands of them), customizations, and an acronym-filled language all its own. The project grew, as it does at a software company where everyone wants more features and functionality, and what began as a general overview, expanded into eight different SAP categories with three levels of difficulty. I’ve learned A LOT about SAP while researching questions for this quiz: there is a rap song, a substantial amount of Chuck Norris-style SAP jokes, and data geek speak that makes my head spin. I have a lot of respect for those of you that are experts; I’m more of an aspiring fledgling. I also confirmed something I already knew – techies love quizzes. 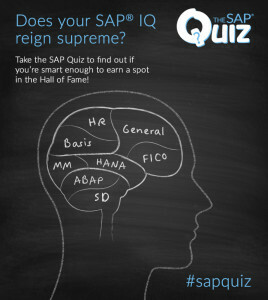 Just like them, I’m competitive, so I challenge you to beat my SAP General IQ score. See if you can earn a spot in the SAP IQ Hall of Fame! And I encourage you to send me your feedback: acacia.krebs@winshuttle.com. I may have an in with the developer that can get reasonable requests filled. Based in Seattle, Acacia is responsible for all aspects of marketing communications at Winshuttle.